Ed Hamilton presents Joseph Kern of Greensburg, Pennsylvania—Methodist or Lutheran? posted at My Old Ohio Home – Articles, saying, “When asked to write about an individual ancestor’s place of worship, you usually don’t have ask, ‘Which one?’ But when I researched my ggg-grandfather Joseph Kern (1772-1846), I ran into a bit of a problem. Let me explain.” If you aren’t sure what faith your ancestors practiced, Ed offers some great advice on how to find out. Bill West presents 1899 SUMMER PLEDGE DRIVE FOR THE UPTON UNION CHURCHposted at West in New England, saying, “Some images on the Upton (Me.) Historical Society’s Facebook page gave me information I never had before about where my great grandparents worshiped.” Bill has a very interesting find that told him where his ancestors worshipped! Linda Gartz presents A Matter of Faith posted at Family Archaeologist, saying, “My ancestors’ churches in Romania revealed a trove of unknown family history that led us to Alsace, where we followed the lineage trail. But what to do if you’re not sure you can trust the genealogy a church presents? A Matter of Faith?” Wow, Linda’s ancestors left behind a fascinating faith-related resource that led to more genealogical clues…we look forward to the continuation of the story on her blog. Judy Cole presents Yom Kippor posted at The Genealogy Gals, saying, “This is a very personal look at places of worship I have attended with my family.” Judy presents a heart-warming story of her emotional connection to her family’s Jewish faith traditions. Julie Hogston presents The Church at the Top of the Hill posted at Wandering Roots, saying, “Three of the places of worship that I have attended in my life time thus far.” Julie presents some beautiful memories of the churches she and her family have attended – and the emotional connection she maintains with those places. TCasteel presents John Warburton – A Particular Baptist posted at Tangled Trees.TCasteel’s ancestor became the first pastor of a Baptist church back in 1815! Jasia presents St Lawrence Catholic Church, Wojnicz, Poland posted at Creative Gene, saying, “This church was the place of worship for many generations of my maternal grandmother’s family. It’s a viable parish serving the Catholic faithful in Wojnicz, Poland since the 1200s. Come see the beauty!” Jasia’s family’s place of worship has been around a very long time! She not only presents its long history, but also shares some lovely scrapbook pages and links. Mary Ellen Gorry presents Hempstead history: St. George’s Episcopal Church posted at Threading needles in a haystack: the genealogy journey. Mary Ellen writes about her ancestor’s Episcopal church which is rooted in American history. Karen Hammer presents A Parochial Tradition posted at Ancestor Soup. Karen offers a look at another historical Catholic church – this one in South Dakota. 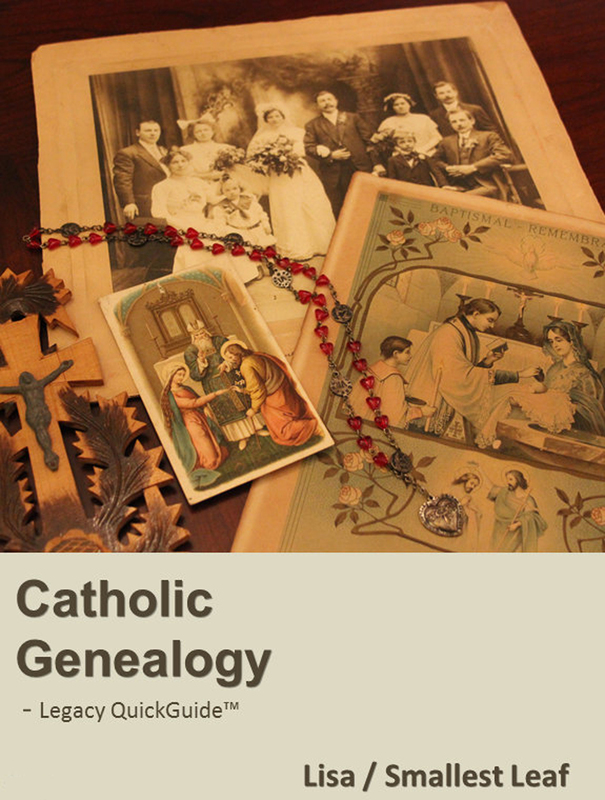 Carol presents Churches in Our Family History, The Lutheran Story, the 109th Carnival Of Genealogy posted at Reflections From the Fence, saying, “A look at four Lutheran Churches that play a huge part in our family’s history, so many baptism, confirmation, marriage and death records. Showing off photos of the churches (one was built in 1738). Toss in a photo of Reflections and Man way back when our first baby was baptized and a document from 1836. Reflections spanning the years, Lutheran style.” Carol’s history of the family’s Lutheran churches offers a great historical glimpse into both the churches and how they contributed to the family’s genealogical history. 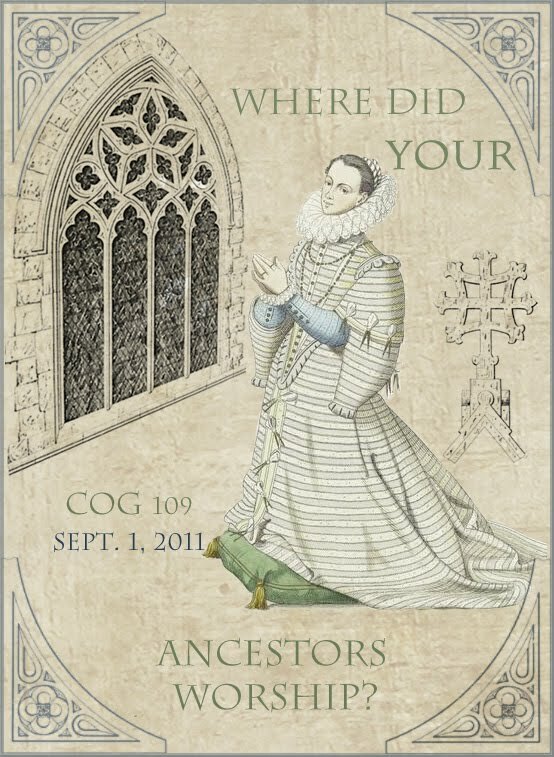 Julie Goucher presents Carnival Of Genealogy 109 – Our Ancestors’ Place of Worship! posted at Anglers Rest, saying, “Places of Worship in Surrey.” Julie presents some awesome photos of her ancestors’ churches in Surrey. Terri O’Connell presents COG ? Our Ancestors? Place of Worship posted at Finding Our Ancestors, saying, “Our places of Worship, from Catholic to Lutheran”. Terri, our favorite Irish Lutheran (yes, you read that right! ), presents some great pics from her family’s churches. Jen Smart presents The Children of Peace & the Sharon Temple posted at Jen’s Genealogy Pages, saying, “The architecturally unique Sharon Temple, located in Sharon, ON, was built by the Children of Peace, an offshoot sect of the Quakers. Some of my ancestors were members of this religious movement.” Jen offers a fascinating glimpse of her family’s involvement with the Children of Peace. Geniaus presents Carnival of Genealogy, 108th Edition – Places of Worship posted at Geniaus, saying, “Not an old church, the St Vincent’s College Chapel played a large part in my life.” Wow, with a great Holy Communion photo like that, Geniaus belongs on staff here! I wish that my school had a chapel that beautiful. John Newmark presents Amanuensis Monday: A Historical Look at United Hebrew Synagogue – 1915 posted at Transylvanian Dutch, saying, “In this entry I transcribe a newspaper article from 1915 that provides a history of the congregation my grandmother attended from when she was a child, as well as a description of the synagogue building in 1915. The congregation would move again in the 1920s.” If you’re trying to find out more about the history of your ancestor’s place of worship, follow John’s lead and look at old newspapers – he found a great history of his family’s synagogue. Nolichucky Roots presents At Road’s End, Catholics in the Northern Neck posted at Nolichucky Roots, saying, “My husband’s family worshipped at home for much of the 19th century until the first Catholic church was built at the tip of Virginia’s Northern Neck.” Susan offers a great look at American Catholic history with the story about the lengths her husband’s family went to practice their faith. Kristin Cleage Williams presents From Montgomery to Detroit, A Congregational Church – COG Our Ancestors Places of Worship posted at Finding Eliza, saying, “Moving from Montgomery to Detroit, my grandparents took their religion with them.” Kristin also gives us a peek into American history – this time, with the story of the Congregationalist church of her ancestors. Apple presents Thomas Berry and the Church of England posted at Apple’s Tree, saying, “Thomas Berry was a lifelong member of the Church of England, a faith I knew little about. I have explored the churches he attended both in England and Canada.” Apple may have known little about the Church of England when she started researching, but her research for this post is so thorough that we will all learn a lot about it too. Cynthia Shenette presents Going Home: Our Lady of Czestochowa, Worcester, MA posted at Heritage Zen:, saying, “One family, one parish, and a hundred years of history…” Cynthia said it best in her comment – what a glimpse of her Polish family’s church! Steve Danko presents History of the Holy Cross Church in Warsaw, Poland posted at Steve’s Genealogy Blog, saying, “A brief history of Holy Cross Church in Warsaw, Poland, the church where my third great grandparents were married. The church had had a long history and has played a significant role in religious life in Warsaw for six centuries.” Hmm, did Steve and Donna’s ancestors know each other from attending the same church? As friends and co-authors on this blog, we would like to think so. You won’t find out in his article, but you will learn about the long history of Warsaw’s Holy Cross Church. Dorene Paul presents Brother Sulpicius, C.F.X. (Nicholas Charles Cross) posted at Graveyard Rabbit of Sandusky Bay, saying, “While Brother Sulpicius worshipped in several different states, the Catholic church associated with St. Joseph’s College in Bardstown, Kentucky was especially dear to the heart of this ancestor of Dorene from Ohio.” Dorene writes about her great-great-granduncle, a religious brother with the Xaverian Brothers. What a great find that led to learning more about his life and personality! Donna Pointkouski presents Praying With My Ancestors: The Stadtpfarrkirche posted at What’s Past is Prologue, saying, “What a joy it was to visit the church that my Catholic Bavarian ancestors attended for centuries!” Donna offers a look at the Catholic church attended by her ancestors for many years in Pfaffenhofen an der Ilm. Denise Levenick presents Praying With My Ancestors: A Pilgrimage of Sorts posted at The Family Curator. Denise writes about her ecumenical family and some of the great documents she has found in her research. Lisa presents The church on the postcard and the faith of my ancestors posted at 100 Years in America, saying, “An old postcard with the picture of my immigrant great-grandmother’s parish church in the old country sparked my interest in the Catholic faith of her Croatian-Hungarian ancestors.” Read about the beautiful 18th Century Baroque church of the Holy Trinity where Lisa’s ancestors worshipped for several hundred years. That concludes this edition of the Carnival of Genealogy. Call for Submissions! The topic for the next edition of the Carnival of Genealogy is: What tree best represents your family’s history? Is your family most like a towering redwood, weeping willow, or a stately oak? Maybe you think of your family more like a brightly lit Christmas tree or a tropical palm. Whatever your choice, write it up and tells us why and submit your article by the deadline of October 1st. Submit your blog article to the next edition of the Carnival of Genealogy using our carnival submission form. Please use a descriptive phrase in the title of any articles you plan to submit and/or write a brief description/introduction to your articles in the “comment” box of the blog carnival submission form. This will give readers an idea of what you’ve written about and hopefully interest them in clicking on your link. Past posts and future hosts can be found on our blog carnival index page.